The World Cup is more than an International football competition, it is one of those rare global events that brings the planet together. Whatever peoples interest in football on a day to day basis we all tend to have an allegiance or an opinion when it comes who will win the so called ‘Greatest Show on Earth’. Many of us, whether we bet often or not, like to back our home or favourite team, or at least wager against our enemies. The World Cup only comes around once every four years and online bookmakers save up some of their very best free bet and enhanced odds offers to attract both new and loyal customers during the month long spectacle. Whether you are looking for a high value welcome offer or a good existing customer deal for regular betting throughout the World Cup then you have come to the right page. Below find our top free bets, new customer price boosts and the latest offers for all customers. Further down we’ve got the full schedule as well as World Cup odds, history, stats and key facts. New online customers only. Min. unit stake of £10/€10 at odds of 1/2 or greater. Only the “win” part from EW bets will count. Free bet terms, payment method & country restrictions apply. Free bets credited as 3 x £10/€10. Free bet stakes are not returned as part of the settlement of successful free bets. All Free Bets must be wagered within 30 days. Offer for new customers, deposit minimum of £10, enter code 30f. Place a 'real money' £10+ qualifying bet on any sports market with minimum odds of 1/2 (1.5). Free bet tokens (3x£10) credited on bet settlement and expire after 7 days. Winnings from free bet cash, stake itself not given back. Withdrawal and deposit restriction apply. New UK & Ireland customers. Deposit (credit, debit card or PayPal) minimum £10 in 7 days of registration. First deposit matched up to £30. Wager deposit 1x at 3/4 (1.75) to release free bet, expires after 7 days. Full T&Cs apply. New customers referred by a Google Ad or selected affiliates only; Min. deposit £15; Bonus amount is 100% of deposit (up to £100); 6x deposit and bonus turnover (min. odds 1/1 on singles and 2/5 per selection on acca bets), in 30 days, for bonus release; Some bet types don’t contribute to turnover – see full terms; Withdrawal before turnover results in bonus cancellation. New UK (mainland only) customers (18+). Opt in on sign up, deposit and bet £10+ at evens (1/1)+ odds (each way bets or Asian handicaps) within 2 weeks to receive a £10 free bet token within 24 hours valid for 30 days. Full terms apply. Open to new and existing customers the concept of this offer is very simple. The user who placed a bet on any world cup market with the highest overall odds will win (or share) £1,000,000 in real tax free cash. The offer is applicable to all winning wagers placed on the world cup with a stake of £1 or more, this includes any single bets but not multiples or accumulators. It also includes the #PriceItUp market, which is a very good way to build bets with high odds. On top of the overall prize there is also a £5,000 prize to the customer with the highest odds winning bet on each of the 25 match days during the tournament (or shared if more than one with same odds). The top 100 positions on the leader board at the end of the World Cup will also share £5,000 in casino bonuses (x wagering requirement, selected games). 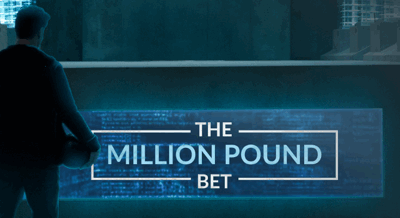 For more about the offer read our dedicated page, or to play visit BetVictor below. Place a £5+ bet on any world cup fixture (pre-game or in-play) and get an entry into the jackpot for that game. 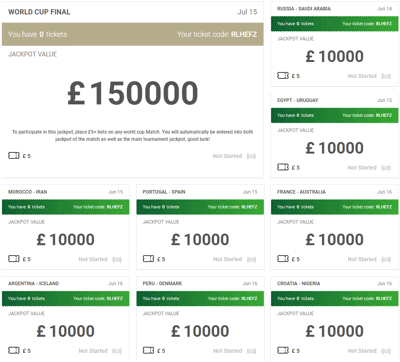 There is a jackpot prize for all 64 games, starting at £10,000 for each group game and rising through the knockouts (£15k 2nd round, £30k QF's & third place play off, £40k SF's) with a £150,000 jackpot for the world cup final. After each fixture a draw is made, within 15 minutes of full-time, and ten tickets are drawn, the prize is then split between the ten winners and will be in your account within 15 minutes of the draw. If you place a £5+ multiple bet you will get an entry into the jackpot for each relevant match, e.g. place a treble on three different group stage games and get three tickets, an entry to the jackpot of each game. 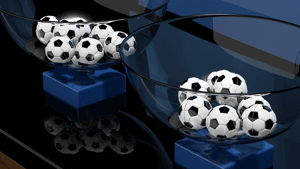 There are no minimum odds required to qualify either and no maximum ticket limits per game, or overall. Each £5 bet will earn you one ticket to the game you bet on PLUS one additional ticket for the World Cup Final draw. Also for every £5 increment you wager you will also get another ticket, e.g. bet £10 on a match and get four tickets, two jackpot entries for that game and two entries for the final, place a £10 double get six tickets, two for each game and two for the final, etc. This is the type of promotion that is perfect for any punter that was going to place £5+ singles or accumulators on world cup matches anyway. If you are going to place these bets you might as well be in with a chance of winning a cash jackpot prize too. The system of qualification for the World Cup involves what are in effect six smaller tournaments. Each continental zone, as defined by FIFA (Africa, Central & North America, Europe, South America and Oceania), are given several finals places depending on the coefficient measure of how strong the leagues and teams are from that area. For 2022 this results in 13 slots for Europe, 5 for Africa, 4 or 5 for Asia and South American, 3 or 4 for North and Central America, plus Qatat who qualify as hosts. The remaining two spots are decided by an inter-confederation play-offs, off which Oceana can only win one possible place. Africa (5 Places) – 52 teams in the preliminary rounds are reduced to 40 teams split into 10 groups of 4, 10 winners play each other to whittle down to 5 qualifiers. Asia (4 or 5) – Two knockout phases result in 20 teams that are split into 5 groups of 4 followed by 2 group of 5, with winners and runners up of both groups going to the finals. The top runner up gets to go to the inter-confederations play off. Central and North America (4 or 5) – The 6 best of 30 teams that qualify prom the pre-lim rounds get a bye while the other 24 teams compete in 6 groups of 4. This is followed bu 3 groups of 4 with the three victors getting a world cup finals spot and the highest runner up going into the inter-confederations play off. Europe (13) – 53 teams divided into 9 groups, the 9 group winners qualify with the 8 highest runners up competing in a playoff for the final four places. Oceania (0 or 1) – Qualification for this continent changes often but suffice to say in the end just one team gets a place in one of the inter-confederations play off games. South America (4 or 5) – At last a simple one. Here we have one group of ten teams, the top four go to the finals and the fifth placed teams gets an play off slot. Inter-Confederations Play Off (2) – The highest runner up from the Asia and both Americas groups along with the winner of the Oceania qualifying enter this play off. Two matches are played, the winners go to the finals. There will be 64 matches played between 32 teams at the 2022 World Cup finals in Qatar, made up of 48 group games followed by 26 knockout matches. The 32 national sides are divided into 8 groups of 4 teams. The top 7 teams in the world (as defined by FIFA rankings) and the hosts are seeded into eight different groups. 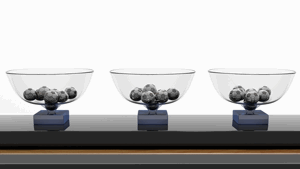 The remaining teams are divided into geographically based pots and then drawn randomly to the rule that no group will have more than two European teams or more than one team from any other confederation. Six games take place within each group with the winner and runner-up progressing to the last 16. See further up this page for a full schedule of the tournament. From 2026 onwards in the USA/Mexico and Canada the tournament will be expanded to 48 teams, the brain child of FIFA president Gianni Infantino. This will consist of no less than 16 group of three teams each followed by a 32 team knock out phase. By my reckoning that will be 80 games to cram into the four-week tournament. The idea is to open the World Cup spectacle up to more nations, but critics say this is a decision based solely on money. It’s hard to know until it comes in whether it will devalue the tournament or not but from the early discussions of how the extra 16 places will be allocated most positions will go to established confederations. The first World Cup game along quite late really when you think that international football competitions had been going for over half a century before the first tournament in 1930. England played their first international match against Scotland in 1872 and the first Home Championship (also including Wales and Ireland) followed in 1884. What happened therefore that delayed a truly international tournament for 50 years or more? FIFA was set up 26 years before the first World Cup, back in 1904. At that time the biggest, truly international, football competition was held at the Olympics and FIFA’s initial attempt to create a tournament away from the Games in 1906 failed miserably. The political landscape in Europe over the next 15 years largely prevented any real momentum in starting an inter-continental football tournament until after the first world war. By 1920 the Olympic movement recognised the amateur football on offer at the Olympics wasn’t suited to the professional teams and players that now dominated the top leagues. They therefore arranged the first proper inter-continental football tournament, consisting of mainly European teams, it was won by Belgium. The inter-continental tournaments in 1924 and 1928 saw Uruguay come out as gold medalists on both occasions and the popularity of the competition began to rise. FIFA therefore had another go at creating an international tournament and invited Uruguay, as then Olympic champions, to host the new event in 1930. Jules Rimet, the FIFA president at the time and namesake of the trophy, was integral in the setup of the first tournament, persuading twelve other top nations, including France, to join the event. The first tournament had 13 teams, with 3 groups of 3 and a group of 4, with the winners competing in a semi-final and then a final, just 16 matches in total. Hosts Uruguay solidified their title as best in the world form the Olympics by also winning the new World Cup, beating Argentina 4-2 in the final in Montevideo. The 1932 Olympics were held in LA and therefore football was dropped due to a lack of local interest and by the time the 1936 Olympics (yep that famous one in Hitler’s Berlin) another world Cup had taken place, Italy 1934, and all eyes were on the next one in France in 1938. The World Cup had successfully become the greatest international football tournament, beating the Olympics. Italy won both the 1934 and 1938 World Cup but the 1942 World Cup was postponed for obvious reasons and the 1946 event was also cancelled as it was more of a priority for nations to clear up the carnage of the second world war first. In 1950 the FIFA World Cup started up again with its fourth incarnation, this time Brazil playing host and losing the final to Uruguay 2-1. This was in fact the first tournament to feature an England team, and true to form they were eliminated at the group stage. At the time, just five years after WWII, the World Cup became a global symbol of togetherness in the background of a heavily divided world in the early days of the Cold War. This, combined with increasing audiences and television broadcasts and an increasing global presence of football in general resulted in a boom in the World Cup’s standing with ordinary people. The 1954, 1958 and 1962 tournaments, hosted in Switzerland, Sweden and Chile, were equally successful and witnessed the first two big World Cup heavyweights of the future. Following defeat in 1950 Brazil finally won the first two of their five Jules Rimet trophy’s in 1954 and 58 before Germany (then West Germany) won the first of their four titles in 1962. For those in England at least, it was 1966 that kindled a love affair with the trophy that has alluded us ever since. England hosting for the first, and only time so far, beat their old war rivals Germany 4-2 in the final at Wembley. A feat not matched in over 50 years since. It was Brazil that came back to dominance in 1970 in Mexico winning for the third time. For this accolade they got to keep the original trophy and a new one was made, named the FIFA World Cup Trophy, it is still in use today. West Germany pegged the Brazilians back a little by winning their second Cup in 1974, as hosts, before Argentina, beaten finalists in the first World Cup were victorious, again as hosts, in 1978. In 1982 the number of entrants into the finals increased by a third, from 16 to 24. This was in part driven by public demand for a larger more inclusive competition and partly by the commercial side of the World Cup, which had begun to really take off by the 1980’s. The rising celebrity of football coupled with exponentially more money in the game allowed the World Cup to become a cultural phenomenon during this time. Suddenly it was about far more than just football, and for the nations that got to host the World Cup it became an opportunity to show off tourism prospects to the globe. The fact the world has become more peaceful has also helped the World Cup, which for many has become a modern playground for old nationalistic rivalries. Italy won their third trophy in 1982 in Spain, although unlike when Brazil did it they didn’t get to keep the cup. Argentina won their second world cup in 1984 in Mexico before West Germany won their third trophy in Italy, 1990, having been beaten finalists in 1982 and 1986. Brazil then reclaimed their mantle as the top world cup winning team grabbing a fourth tournament win in 1994 in the USA. By 1998 interest in the ‘Greatest Show on Earth’ had easily reached the same heights of the Olympics, if not even further. 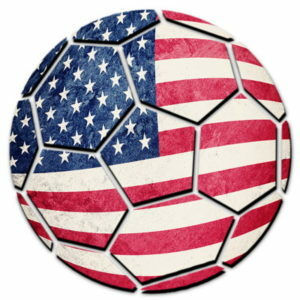 Not only was the World Cup one of the biggest National sporting prizes on the planet, the fact the USA were not central to the equation seems to only increase its charm. The tournament increased in size again for the France 1998 tournament with 32 teams now entering 8 groups of 4 teams. The first two in each group entering a knockout of 16 teams. France won the World Cup for the first time on home soil beating Italy in a sour tempered final. Brazil went two clear at the top of the winners chart taking their fifth crown in 2002, the first finals to be held in Asia and the first to be split between two nations, South Korea and Japan. Germany hosted in 2006 although it was Italy that trumped their party, taking a fourth title, and overtaking Germany’s three cups in the process, beating France in the final. Spain finally got in on the act in 2010 winning their first world Cup in South Africa, the first tournament to be held in Africa. They were widely renowned at the time as being the best team in the world having won the 2008 European Championship and then going on to win the 2012 Euros. Old service was resumed in 2014 when a dominant Germany team claimed their fourth title from 8 final appearances and their fist as a united Germany rather than West Germany. They famously embarrassed Brazil 7-1 in their own country along the way to winning. 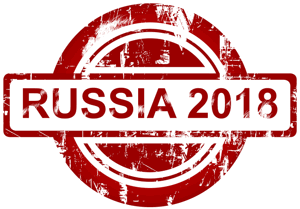 Russia 2018 was the most controversial tournament ever, and many will always question how honourable the selection process was and when you combine this with the Russian Olympic doping debacle there is little to suggest it was an honest selection. Despite this fact the event turned out to be one of the most watched in history with England in particular surprising many to reach the semi-finals before being knocked out by Croatia 2-1 in extra time. Croatia then went on to lose 4-2 to France in the final with the Les Blues winning their second world cup at their third attempt. The Russian themselves were perhaps the biggest surprise of all, they were rank outsiders before the tournament with many expecting the hosts to be embarrassed. Not only did they hold their own they got to the quarter finals beating Spain on penalties along the way and were only just beaten by eventual finalists Croatia. Russia 2018 will be followed by the even more controversial World Cup held in Qatar in 2022. The event is to move to the Winter months and will be played in air conditioned stadiums – If you ever want to see corruption at its worst then this is a classic example of bare faced money grabbing greed at the heart of FIFA – I mean playing football in a desert, WTF. This will be the last world cup in its current format. There will be 8 venues, all constructed especially for the event. Four stadiums will be in Doha and the rest in 4 surrounding regions. What exactly will become of these venues is unknown, many are earmarked to become indoor ski venues (yes, in the desert). Many, me included, think the Qatar WC is capitalist corruption gone mad, others think it is refreshing for the pinnacle of football to take place in new lands. Following Qatar the 2026 World Cup will be expanded (see next) and held across three nations, the United States, Mexico and Canada. In some ways, it is surprise it has taken this long for the World Cup expansion idea to take hold. I think had the FIFA corruption scandal not unveiled itself when it did that this may have happened even sooner. The decision to expand the World Cup to 48 finalists is largely financial, we can’t hide from this fact, but it will have secondary benefits, such as developing football in countries that wouldn’t usually get there. The details are still sketchy and it is not fully understood where the extra 16 teams will come for right now. The proposal is to have 16 groups of three teams, with each team playing twice. The bottom team will go out and the remaining two teams will then either go straight into a 32 team knockout or they will be entered into a second group based system as we have now (8 groups of 4). The table below shows how the world cup has grown over its history.